ABS-CBN stars Kathryn Bernardo and Daniel Padilla were spotted at the front row of Bench Fashion Week S/S 2017 Day 1 held earlier, March 10. Kathryn Bernardo and Daniel Padilla showed how couple OOTDs should be done! The Kapamilya stars were spotted at the front row of Bench Fashion Week S/S 2017 Day 1 held earlier, March 10, at the Bench Tower in Bonifacio Global City. It was refreshing to see Kathryn exuding a rock star vibe in her latest OOTD, styled by Kimi and Boop Yap. In a short chat via Instagram, Kimi shared us a few exclusive deets about Kath's edgy look. The Kapamilya actress wore a lace-up band tee from Stradivarius. Kimi said the tee was originally long, but he decided to crop it to suit Kath's slender frame. The lace bralette underneath her tee was from Topshop. Her striped wide leg trousers were from H&M. Completing the young actress' OOTD was a Fendi Baguette Micro Double-Sided Monster Crossbody Bag. It may be tiny in size, but it has a whopping price of P130,000 via online shopping sites. Her black strappy heels were from Stuart Weitzman. 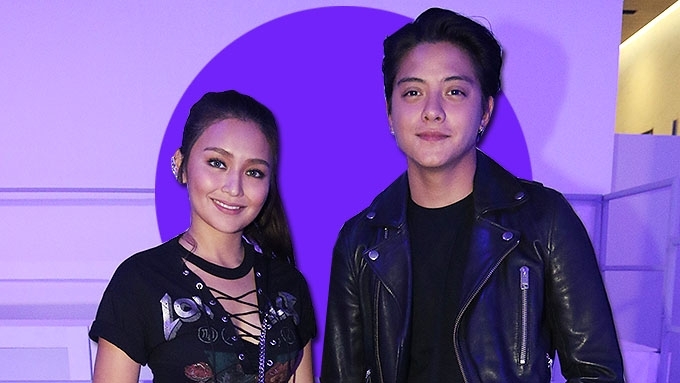 Meanwhile, Daniel Padilla wore an all-black ensemble—from his biker jacket down to his leather boots.